Kalamata Olive Cashew Crème tastes like a creamy olive tapenade, minus the anchovies! The slightly salty, meaty and tangy mix of olives, garlic, herbs, and lemon is the perfect choice for bread, bagels, pizza, crostini, pitas, or bruschetta, or add to any antipasti platter. It is also a wonderful topping for poultry, fish, or shrimp - or toss with hot pasta. Naturally Fermented, Gluten Free, Dairy Free, Soy Free, Vegan, Probiotic. Fresh cilantro offers a bright summer taste even in the dead of winter, and the tiny kick of jalapeno at the end is just enough “kick.” This flavor is a perfect addition to any Mexican recipe, or as a topping on corn-on-the-cob, chili, scrambled eggs, breakfast toast, rice, potatoes, grilled chicken, fish, or shrimp. Also perfect as a dip for crudité or crackers. Naturally Fermented, Gluten Free, Dairy Free, Soy Free, Vegan, Probiotic. This classic flavor has just the right balance of tomato and basil. Naturally sweet sundried tomatoes coupled with the fresh basil, this is a perfect accompaniment with scrambled eggs, salmon, pasta, crostini or bruchetta, or use as a dip for crudité or a topping for bagels or crackers. Naturally Fermented, Gluten Free, Dairy Free, Soy Free, Vegan, Probiotic. The natural tang is more pronounced in the Classic making it a perfect potato or taco salad topping. Top with smoked salmon or jam on crackers or bagels, or add to soup for a creamy richness. The Classic is a Vegan's go-to substitute for sour cream and cream cheese. Naturally Fermented, Gluten Free, Dairy Free, Soy Free, Vegan, Probiotic. 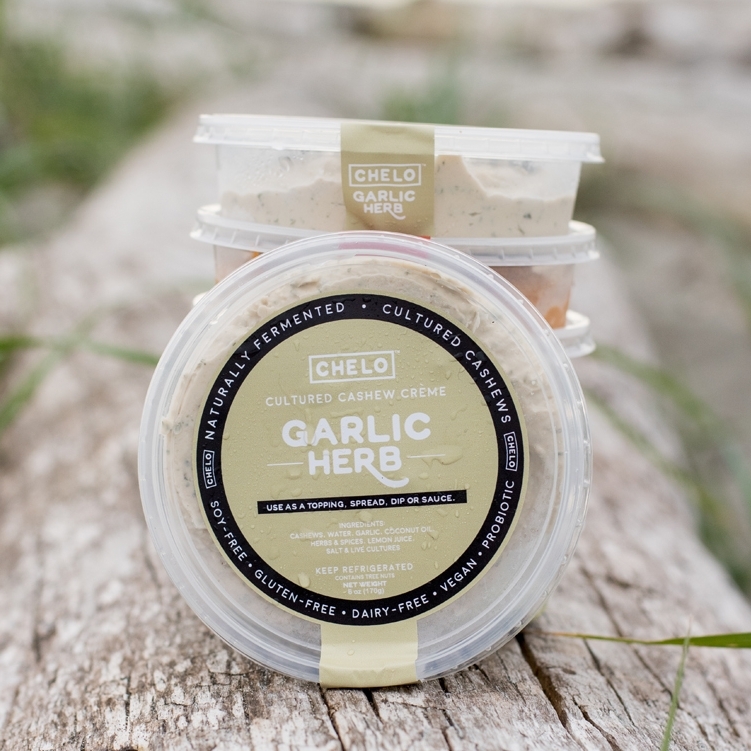 The mix of garden herbs and roasted garlic is an age-old favorite, adding the silky creaminess of cashews puts it over the top! So versatile that it goes with just about everything: a topping for crostini, crackers or bagels, as a dip for crudité, roasted veggies, baked or mashed potatoes, rice, pasta, hot dogs, grilled steak, chicken or fish.